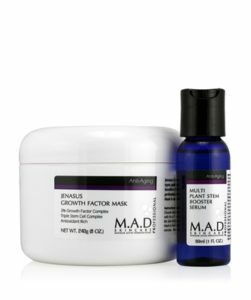 M.A.D.’s Jenasus Growth Factor Mask is suitable for most skin types particularly mature dry, and sun damaged skin. Bioactive molecules capable of penetrating the inner most layers of skin provide the necessary energy and stimulation of the cell to increase oxygen consumption and active ingredient utilization. This enables cell proliferation and a reduction in fine lines and wrinkles, sun damaged skin and/ or rough uneven skin.